Robotics – Caxton Mark Inc.
Palletizing is a demanding application of stacking boxes and cartons onto pallets as the last step in the assembly line before being loaded onto a shipping truck. Pallet pattern flexibility, tooling flexibility, and cycle time are three major challenges of automated palletizing in today's industry. Kawasaki palletizing systems offer solutions to each of these palletizing challenges. Kawasaki offers robot models specifically designed for high-speed, heavy payload, and long-reach palletizing applications. A variety of software options allow the user to rapidly generate pallet patterns and monitor the status of the palletizing system. FANUC M-2iA Robot is a high-speed clocking and assembly robot. 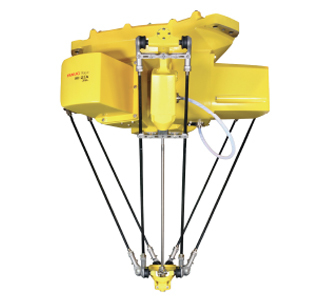 Designed specifically for palletizing applications with load capacities from 80kg to 700kg.